This book . 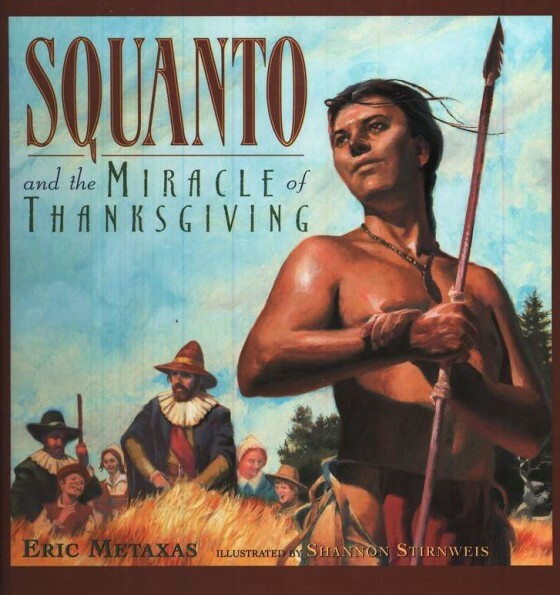 . . Squanto and the Miracle of Thanksgiving--I cannot say enough good things about it. My children picked this book up in our church library; they handed it to me and asked if we could bring it home. We read it together and enjoyed it so much that I wanted to recommend it to my readers here. Partly because I grew up in New England and partly because I love history, the Pilgrims have always held a very special place in my heart. One of my favorite places to visit (we used to camp there when I was a little girl) is Plymouth. I love the cobblestone streets, the roar of the water at the Jenney Gristmill, and especially Burial Hill where many of the great men and women who risked their lives to begin fresh in the New World are laid to rest. I realized that Squanto, of the Patuxet Tribe, helped the Pilgrims to survive in the New World after their harrowing first winter. But this book, written by Eric Metaxas, delves more deeply into the details of Squanto's early life and of his conversion to Christianity that I was not aware of. This book fascinated me. I never realized that Squanto was captured as a young boy and sold as a slave in Spain. I never realized that sincere, compassionate monks bought him and treated him kindly, and then found a way for him to return to his native land. The seed of Christianity was planted in his heart through the loving example of those humble men of God. When Squanto returned to the village where he was born, he learned to his devastation that his entire village had been wiped out--not one member of his tribe had survived--except him--because he had been sold as a slave and had been delayed from returning to his village. Truly, the Lord worked in a marvelous way in this young Native American's life, using, like Joseph, men's evil for ultimate good in the life of Squanto and ultimately for the good of the Pilgrims who were struggling to survive in an unfamiliar place. Squanto was instrumental in helping the Pilgrims to learn to hunt, fish, and plant in the New World. He could even communicate with the Pilgrims as he had learned their language while in captivity. His long confinement had turned into a blessing both for himself and for those around him. What men intended for evil, God used for good. This book is so well worth reading--the paperback is priced extremely reasonably on Amazon. It is definitely a worthwhile book to add to your family library. Eric Metaxas lends his usual wonderful writing style to the book and it is such a rich, historic story suitable for children and adults alike. This sounds like a good one! Thanks for putting it on my radar. I love to give books to my granddaughters! Pinned this great read...thanks for the recommendation! Rebekah, I loved divining in to more details about this book and Squanto! Our thoughts about the pilgrims and first Thanksgiving are so limited and sheltered. This looks so inviting and warm. Thank you so much! Oooh! Eric Metaxas writes an excellent bio, so I'm sure this is a great book! And for more on the life of Squanto for kids, Focus on the Family has done a radio drama that is really excellent! We enjoyed this one too! Thanks for sharing at Booknificent Thursday on Mommynificent.com!